I've read two books in recent months that expanded my conception of noir. One was Craig Rice's The Lucky Stiff. The second is The Blank Wall by Elisabeth Sanxay Holding. The first is a hard-boiled screwball comedy whose ending turns a running joke on its emotional head and lends the book unexpected poignance. The second is a domestic murder mystery whose poignance lies in the protagonist's remaining at the novel's end exactly what she was at its beginning. If that sounds unpromising, think of David Goodis' Street of No Return. 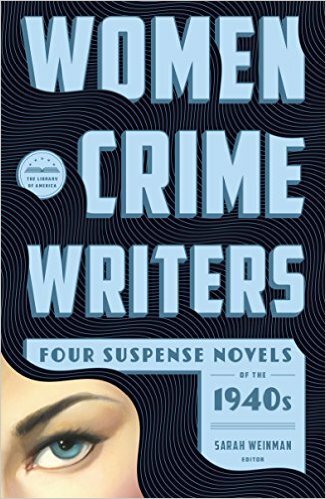 The Blank Wall is included in Woman Crime Writers: Eight Suspense Novels of the 1940s and 1950s, a two-volume set edited by Sarah Weinman and newly published by The Library of America. 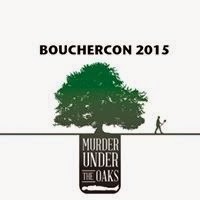 Weinman will discuss Elisabeth Sanxay Holding as part of a panel I'll moderate next month at Bouchercon 2015 in Raleigh, N.C. The panel is called "Beyond Hammett, Chandler, Spillane, and Macdonald," and it features authors, editors, and other experts talking about their favorite crime writers from the paperback-original and pulp eras. The panel happens Thursday, Oct. 8, at 2:30 p.m. See you there. Sarah Weinman will discuss the new collection and other interesting subjects with Megan Abbott on Wednesday, Sept. 9, at 6:30 p.m. at the Mysterious Bookshop in New York. See you there. THE BLANK WALL is a favorite of mine. Glad to see it getting a new audience. Patti, what edition did you first read it in? I know Persephone Books and at least one other press have reissued editions of some of the writers in this collection in recent decades. But our Sarah Weinman is rendering a valuable service by getting these books back into circulation.